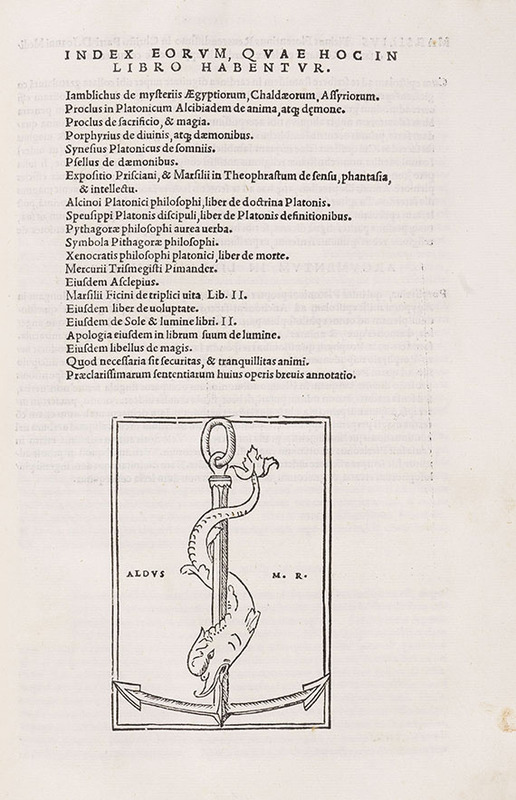 Plutarch, Vitae illustrium virorum. 2 parts in 1 vol. 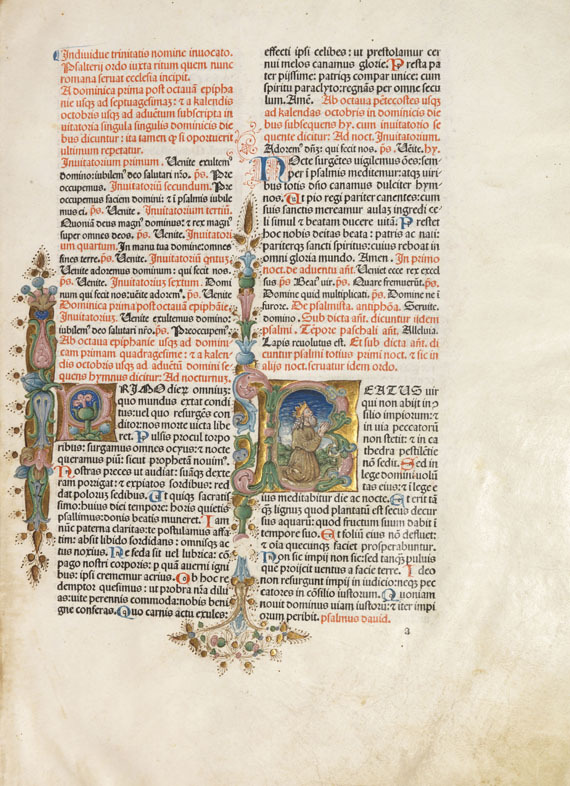 First text leaf with large decorative initial in sheet gold on floral ground in several colors and with gold dots as well as with extension in the same design , right margin with embellished monogram "P B" in sheet gold with color blossoms and gold dots , lower margin also with laurel-crowend coat-of-arms in blue and gold on red ground w ith color blossoms, ribbons and gold dots. 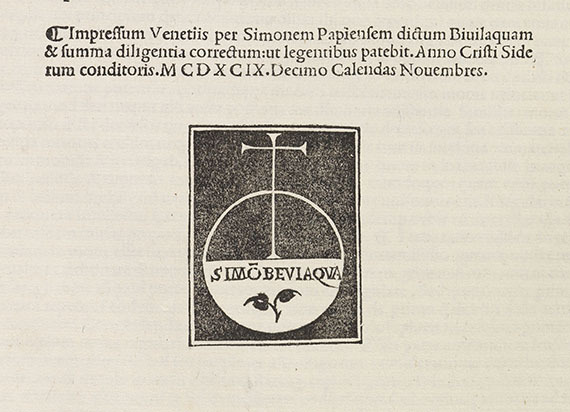 Venice, Nicolaus Jenson, 2. 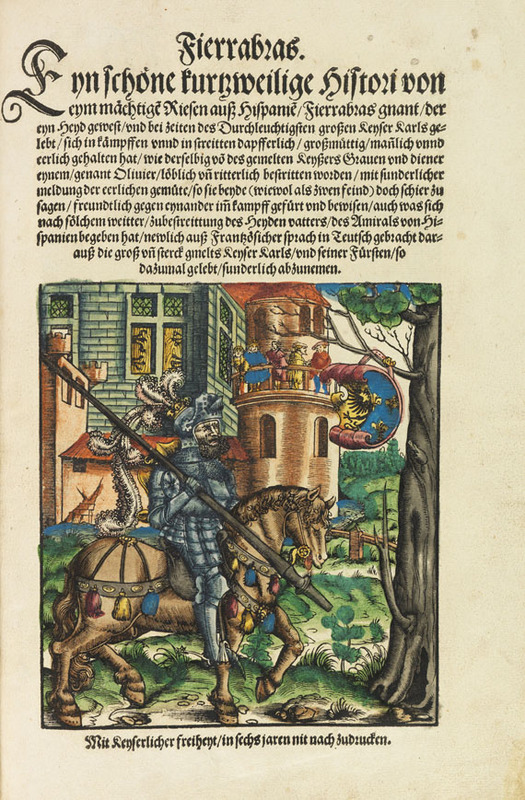 Januar 1478. Contemp. Venetian calf over wooden boards, richly blind- and rollstamped in Islamic style, with brass- corner- and centerpieces, 4 clasps and catches, also with vellum endpapers in red half morocco case with gilt lettering. 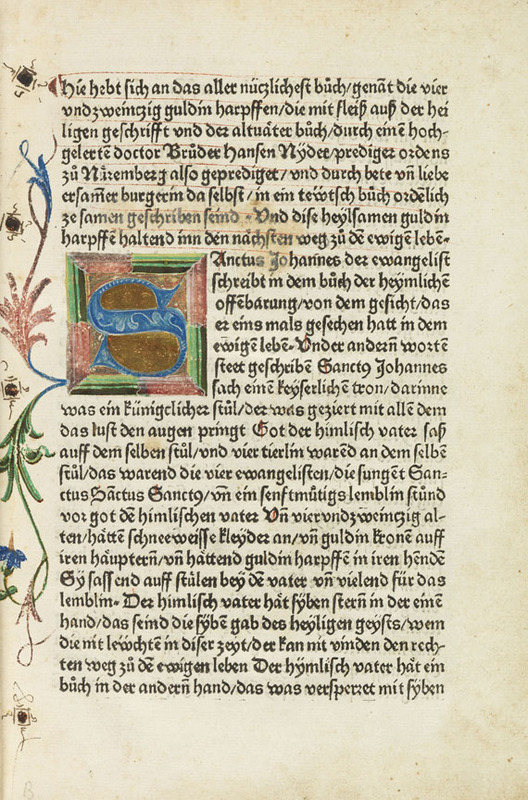 2 parts in 1 volume: 234 nn. leaves (incl. first blank), 227 nn. leaves (lacking first blank). Printed in the famous Jenson Roman type. 50 - 52 lines with initial spatia . One of the finest prints from the famous printshop of Nicolaus Jenson . 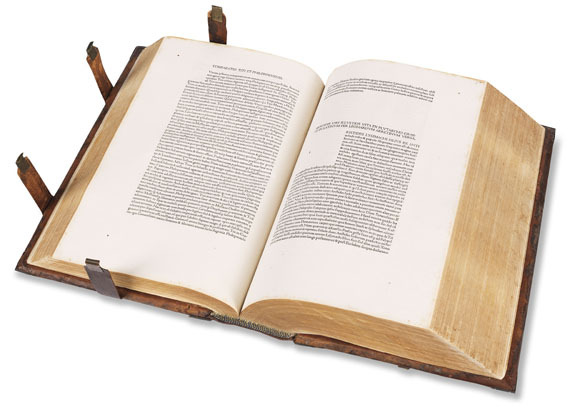 The overall third and best edition of Plutarch's large and influential life descriptions, which made their author one of the most popular ancient writers. 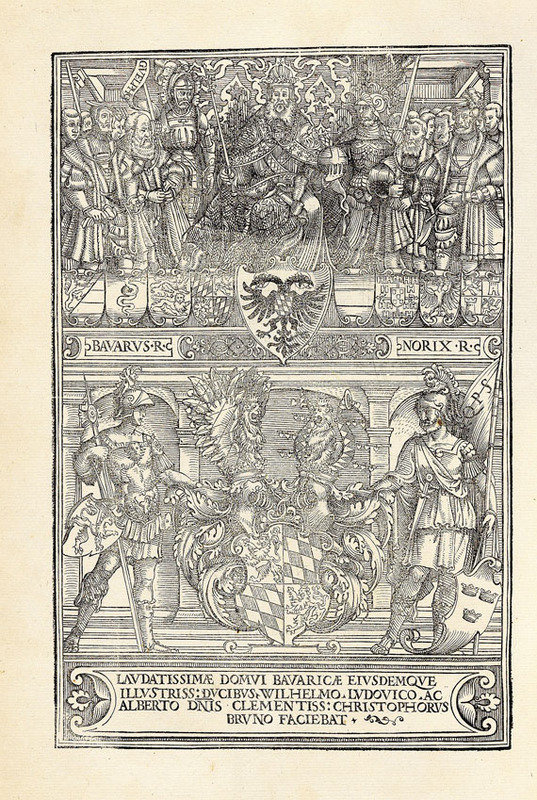 "Shakespeare based his knowledge of the historic background of ancient Rome almost exclusively on Plutarch" (PMM 48). 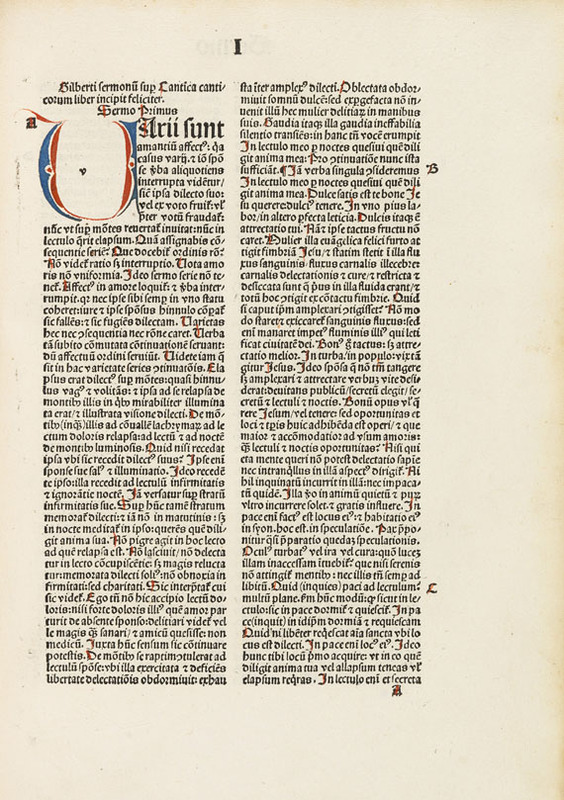 The Latin translations are largely the work by 15th century humanists, including Donatus Acciaolus, Guarinus Veronensis, Leonardus Brunus Are tinus and others. 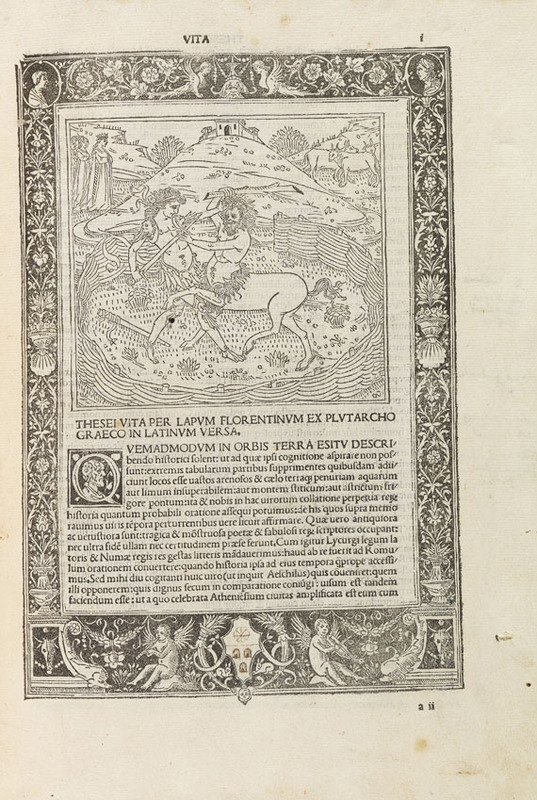 Next to Plutarch's parallel biographies, it also contains the lifes of Hannibal, Scipio Africanus and Charlemagne by Donatus Acciaiuolus, of Titus Pomponius Atticus by Cornelius Nepos, of Cicero and Aristoteles by Leonardus Brunus Aretinus as well as furtehr biographies. 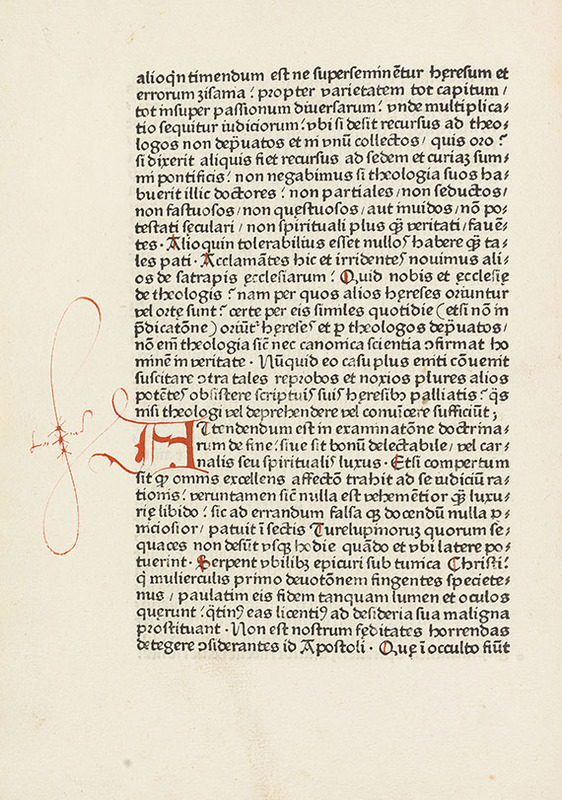 - Outer margins partly somewhat foxed and slightly waterstained, few wormholes (mostly at beginning), 3 leaves browned, first blank on verso with index by contemp. hand (probably Pietro Ginori). Spine renewed, boards restored in places. Altogether fine copy. All in all well-preserved and broad-margined copy from the Florentine family of Pietro Ginori de Riparbello , their painted coat-of-arms (cf. 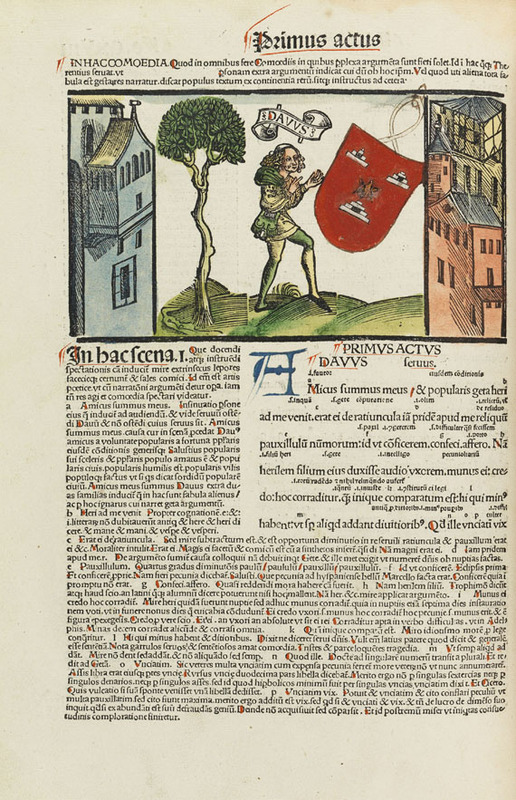 Rietstap G, plate L) in the lower margin of the first text leaf. Right margin with embellished monogram "P B", the flying vellum endpaper with contemp. ownership inscription "Petri Gini de Ginoris" with monogram "PB" and the presumably erroneous date "cccc lxxij" (recte: cccc lxxxij). Hain/Cop. 13127. - GW M34480. - Goff P 832. - BMC V, 178. - Polain 3212. 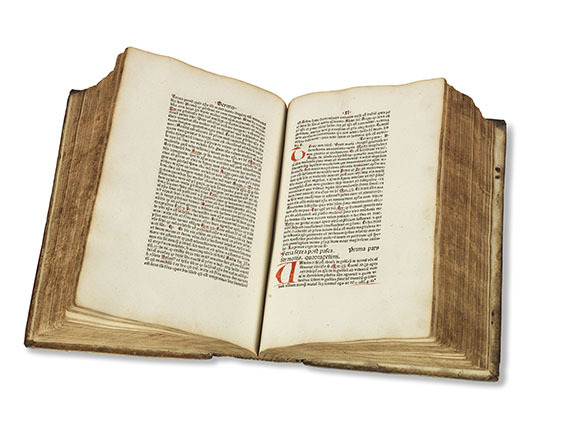 Magnificent and in many respects best and most important edition of the Lives by Plutarch, published by the famous printer, publisher and type-designer Nicolas Jenson. 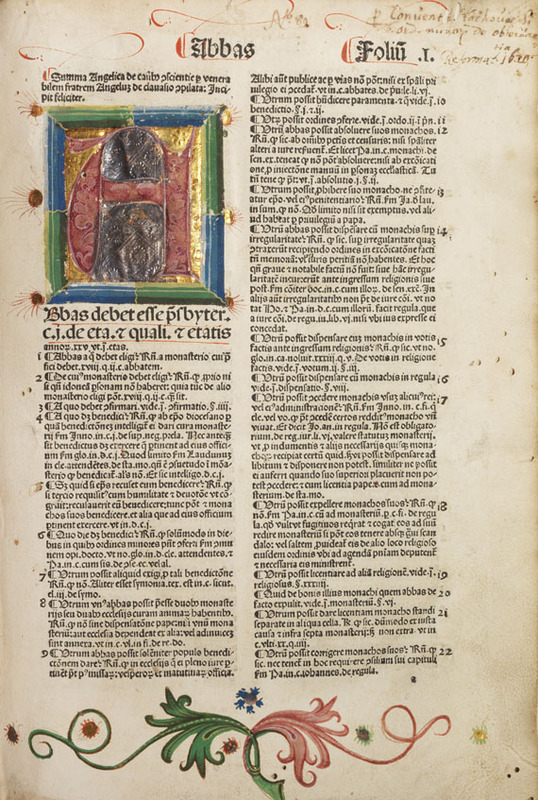 The overall third edition, only preceded by the editio princeps from 1470/71 and the Strasbourg edition after 1471. 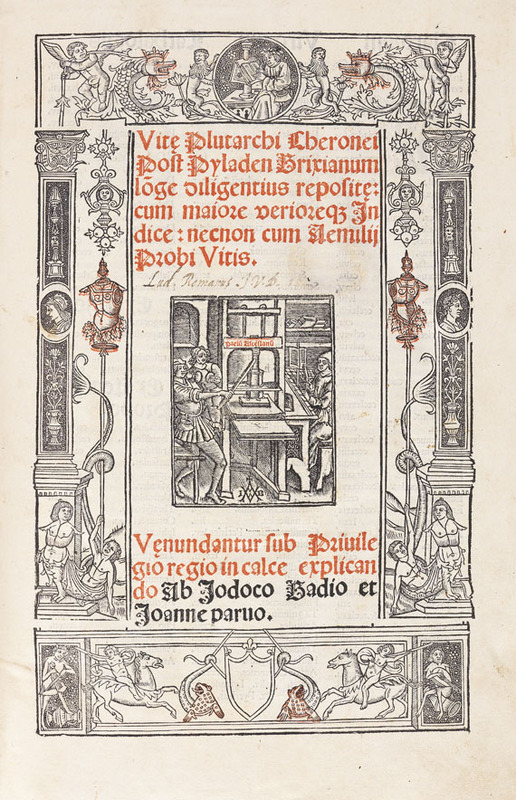 The Latin translations are largely the work by 15th cent. 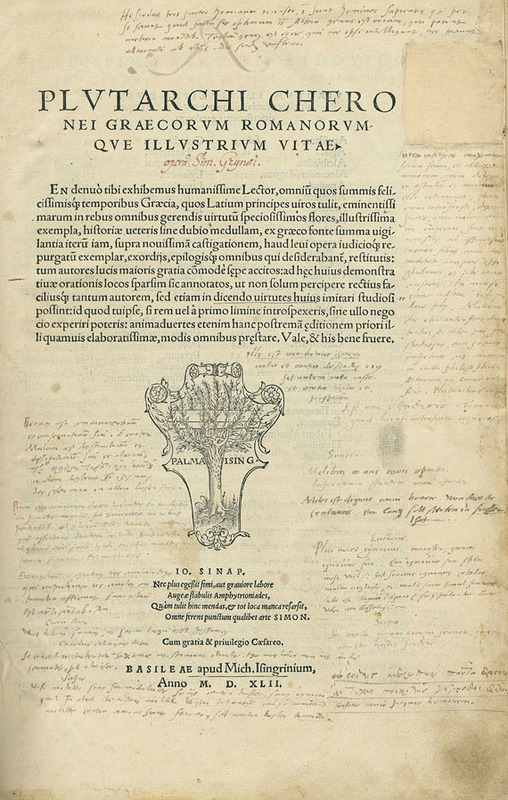 humanists, including Donatus Acciaolus, Guarinus Veronensis, Leonardus Brunus Aretinus and others. 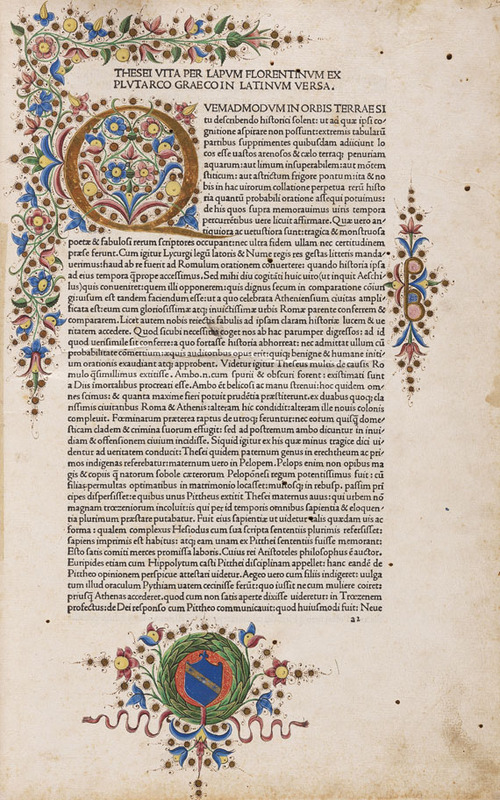 Fine copy from the Florentine family of Pietro Ginori de Riparbello, their painted coat-of-arms in the lower margin of the first text leaf. This leaf with lavish illuminations with large initial in gold on floral ground in several colors and with extension in the same design, right margin with embellished monogram "P B" in gold with color blossoms and gold dots, the flying vellum endpaper with contemp. inscription "Petri Gini de Ginoris" with monogram "P B" and the date "cccc lxxij" (recte: cccc lxxxij). Contemp. 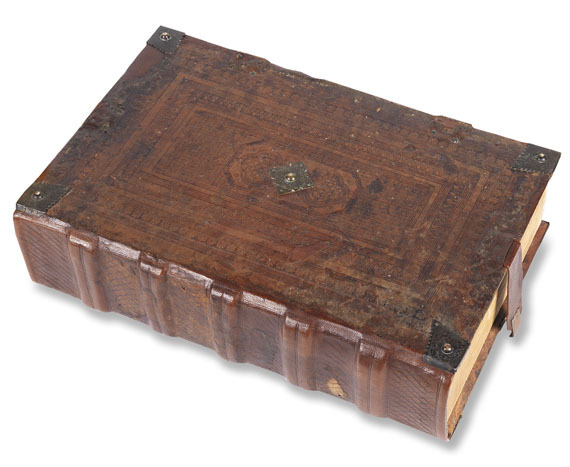 Venetian calf over wooden boards, richly blind- and rollstamped in Islamic style, with brass- corner- and centerpieces, 4 clasps and catches, also with vellum endpapers. 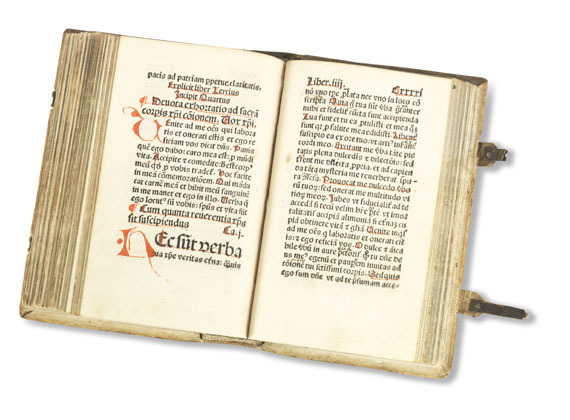 2 parts in 1 volume: 234 nn. leaves (incl. first blank), 227 nn. leaves (lacking first blank). Printed in the famous Jenson Roman type. 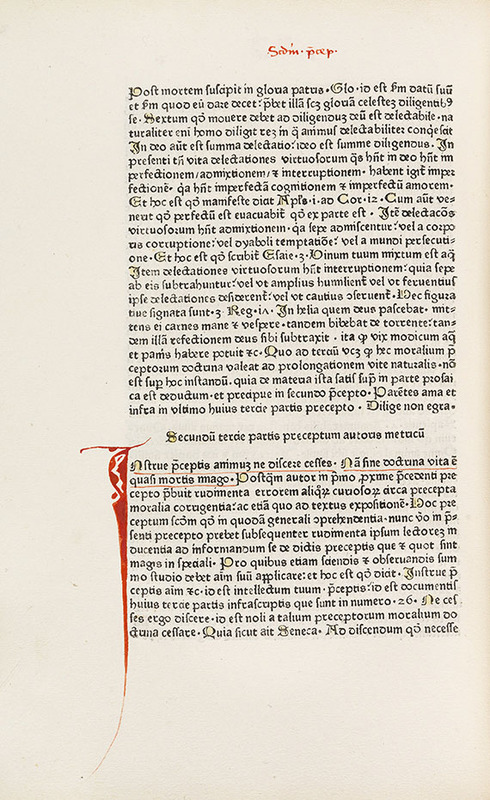 - Outer margins partly somewhat foxed and slightly waterstained, few wormholes (mostly at beginning), 3 leaves browned, first blank on verso with index by contemp. hand (probably Pietro Ginori). Spine renewed, boards restored in places. Altogether fine copy.